Heat the olive oil and butter in a large skillet. Add the onion and fry gently until lightly browned and transparent. Add the garlic and saute for 1 minute. Add the ground beef, chopped apricots, nuts, and spices, stirring often until meat is cooked through. Season with salt and pepper. Off the heat, add cilantro and parsley, if desired. 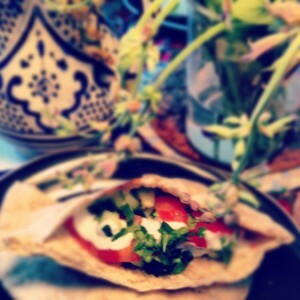 Fill warm pita with beef mixture and garnish with tomatoes, yogurt, and cucumber.